Both the regions are studded with stunning snow covered peaks, glorious glaciers, alpine meadows, crystal clear lakes , holy rivers, flora and fauna. Kumaon consisting of 6 districts, namely Almora, Nainital, Udham Singh Nagar, Bageshwar, Pithoragarh and Champawat. Kumaon is a nature's paradise and it attracts tourist from all over the world. Kumaon is surrounded with high snow covered peaks, beautiful valleys and scenic surroundings. It offers the tourist everything right from scenic surroundings, peaceful environment and adventure sports. 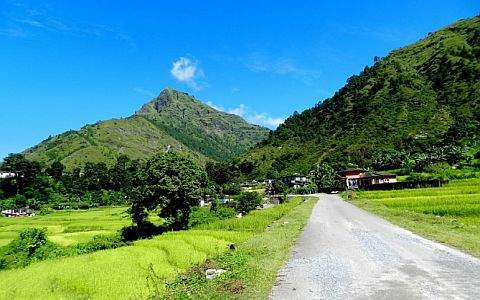 PantNagar and Naini Saini are the nearest Airports while Kothdwar, Tanakpur, Rudrapur are the nearest railway station in the Kumaon region. Buses are also available from nearby cities to the place. Cotton in summer and heavy woolens in winter is advisable. The summer season extends from March to July. The winter season is from September to Febraury. The best time to visit Kumaon will be from March - June and September - October.